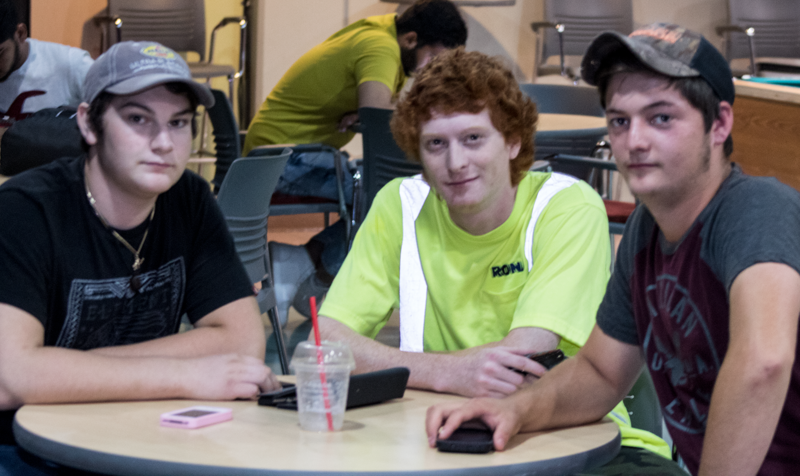 Brayden Ferreira, Noah Wilkinson, and Derek Brushette are three students concerned about the looming college teachers’ strike. Photo by Robert Champagne. BELLEVILLE – The possibility of a college teachers’ strike is looming for some time in October after the union called on the Ontario Ministry of Labour to intervene Friday. The union bargaining team for college faculty in Ontario has asked the government to issue a no-board report, consisting of a letter saying a mediator will not be appointed after talks stalled last week. A no board report, written by the ministry, usually takes a few business days to complete. Once the report is issued, it takes 16 days after the request is processed, then workers can strike, or their employer can lock them out. During the 16-day process, both sides can continue to bargain. This follows the latest round negotiations that began on Sept. 18. This came on the heels of a strike vote on Sept. 14 where 68 per cent of college faculty voted to give the union a strike mandate. OPSEU Local 420 president Eric Bauer, who represents faculty at Loyalist College, said the union is negotiating for a model of shared governance and an equal voice with college administration when it comes to the creation and delivery of online courses. The faculty is also fighting for more full-time teachers, so students’ learning experience is improved, he said. Across Ontario, 81 per cent is delivered by contract or part-time faculty. These people are paid less than full-time professors when it comes to wages and benefits, he said. A wage increase of 10 per cent over three years has been requested by the union. The colleges have offered a 7.5 per cent salary increase over four years, along with a new maximum salary of $115,094 and enhancements to existing benefit packages. David Scott, who is a spokesperson for the College Employer Council, is critical of union demands. “On the issue of academic delivery, faculty are critical to academic decision-making. Faculty, however, are not the exclusive voice. Colleges seek input from a variety of stakeholders, including external accreditation bodies, program advisory committees, employers, students and support staff,” he said. When it comes to union demands regarding control over curriculum, Scott’s views differ greatly from union proposals. Loyalist student Derek Brushette says there is no need for a strike. Noah Wilkinson said he fears losing class time if a strike does occur. “If we’re not here, then we can’t learn anything,” said Wilkinson, a first-year manufacturing engineering technician student. Another student, Brayden Ferreira, 18, said he isn’t pleased with the prospect of a strike. For faculty, it is not about the money, said Bauer.